We keep hearing people around us say that doing business these days is getting tougher and tougher as competition just gets fiercer with each passing day. If you are a business owner or an employee doing marketing for your company, it could be demoralizing to see your competitors' message or logos everywhere. It makes you think - "how can I compete in this cluttered and busy world?" But don't fret, as spreading your brand name or core message could be way easier than you think. Perhaps, you could do television or radio commercials, or maybe an internet banner or video advertisement. These forms of promotions, however, not only involve a lot of effort and huge expenditures, but they are also fleeting - you hear or watch it and it's over in 30 seconds. As soon as they air, they vanish completely together with your hard-earned money! Why not go for something far easier and much more effective? One very smart solution is to print on custom promotional products. This will ensure your messages or your logos last (well, for at least if your giveaways are being used and seen by the general populace, so choose your products wisely!). Bulk printing on giveaways will also give you the freedom and leeway of designing your print space with your logos, taglines, advertising messages, etc., and the creative space on deciding what color products to print and what ink colors to use. Most people love this creative process and seeing their handiwork come to fruition. Deciding what promotional items to go with is very often the first step of the process - one perennial favorite is Promotional Tote Bags. These are always top sellers because they are giveaways that people keep and use and value. Print your company logo on our tote bags which come in all sorts of styles and all different colors to match your imprint colors. There are limitless ways to be creative with these custom grocery tote bags to make your logo or message really shout out to the public and your target audiences. What is best is our quality non-woven totes or personalized canvas tote bags will continue to bear your advertisement for a long time! Imagine seeing your logo being carried around by people 1 year after you have printed on them! This is what we call effective, smart, and cost conscious advertising! Make the people you give these bags to work for you for you by carrying your printed logos everywhere they go! Make your logos do the work they are designed to do - by emblazoning themselves onto the minds of consumers! 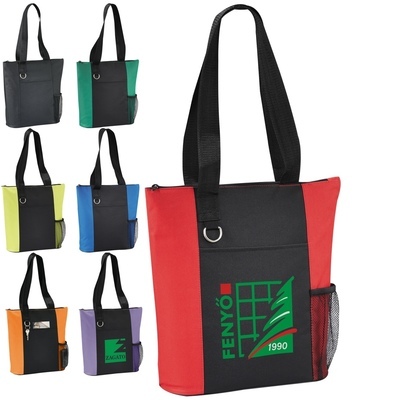 Of all imprinted promotional items, available, promotional tote bags probably offer one of the largest imprint areas. These generous print areas allow your insignia or printed message to be seen or read from a distance and makes it memorable. Mix and match bag colors to make your campaign an even brighter and more colorful event - certain print promotional companies (and ours - PromotionChoice.com is certainly one of them) provide such a service at no additional charge to the customer. * They are extremely useful - people use them for a variety of purposes, as a day to day utility bag, grocery shopping, as book bags, tool bags, or even a handbag. People generally love having a tote bag they like! * Eco-friendly - more and more, grocery stores are phasing out plastic bags, and these totes are becoming increasingly indispensable for people going grocery shopping. Costco for example no longer gives out plastic bags at checkout counters. And most of our tote bags are made of environmentally friendly non-woven material. But just the fact that they are re-useable in and of itself is highly desirable. * They are durable and generally last for years. This greatly extends your advertising time and makes it more economical for you to get these bags. Imagine long after you have spent the money to get these bags printed, they could still be working for you five years down the line! What a deal!